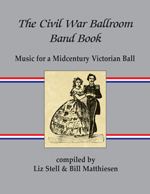 "THE CIVIL WAR BALLROOM BAND BOOK is a remarkably informative and complete resource for reenactors, history teachers, dance organizers and Victoriana enthusiasts. It's a great collection of authentic dance music, with quotes from dancing masters of the period. It even has clear instructions on how to play the music, call the dances and organize your event to best achieve the joy and the spirit of an authentic Civil War ball." Jay Ungar, composer of "Ashokan Farewell"
"Good music should be provided, for bad music will spoil the best dancing, and destroy both the beauty and the pleasure of the entertainment."